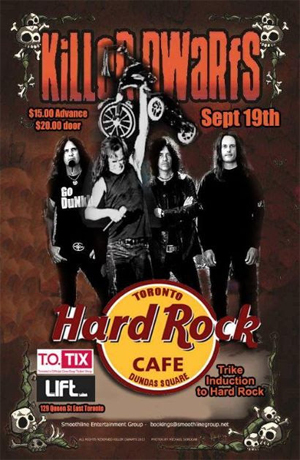 On September 19th, the Hard Rock Café Toronto will host a KILLER DWARFS concert and induction ceremony for their famous tricycle. This show is the confirmed rescheduled date from the postponed June 7th show. All original tickets from advance purchases will be honored. Tickets will also be available at the door day of show. The original date was postponed due to injuries suffered when the KILLER DWARFS were involved in a five-car pile-up in Indiana on their way home from last month's performance at Rocklahoma. In that accident frontman Russ Graham was air-lifted to a local hospital with non life-threatening injuries. "?#?DwarfNation? We sincerely regret to inform you all that the Tricycle induction show at the Hard Rock Café Toronto June 7th 2014 will be postponed. Unfortunately due to the injuries sustained by the band in last weekend’s accident after Rocklahoma, KILLER DWARFS will be unable to perform.The band is very loyal to their fans and feel they are unable at this time to give the fans the performance they deserve. We will be re-scheduling the show for a later date TBA and will honor any tickets purchased for this event. If you require a refund please contact HRrefunds@smoothlinegroup.net and you will be refunded. It saddens us to do this but under the circumstances we hope you #DwarfNAtion will understand under the circumstances. There are no other cancellations anticipated at this time. Thank you all for all the well wishes and prayers. DwarfNation are the best fans in the world!"